declipse®SPECT is designed for seamless integration into the surgical workflow. It is based upon existing gamma probes and thus does not interfere with their current usage. 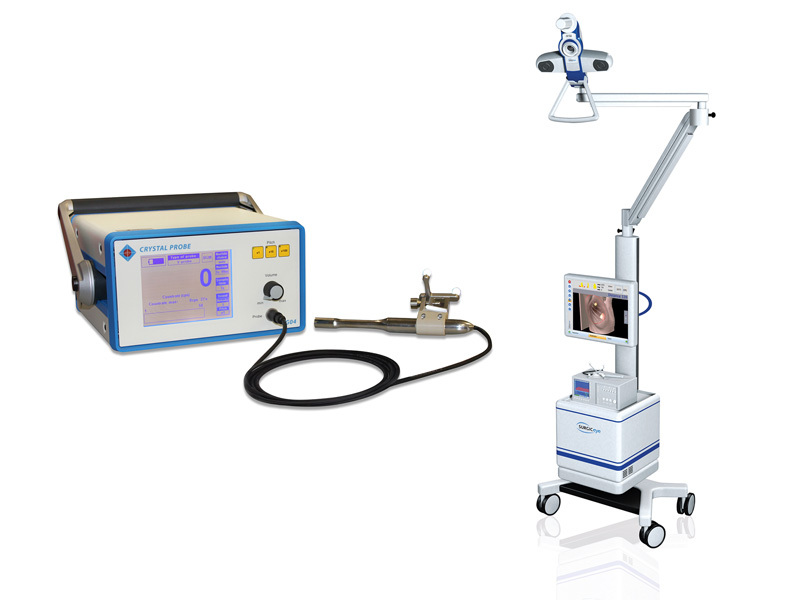 It provides images at the time of surgery and thus precise localization of the structures that need to be resected. The system is positioned next to the operating room table and its portable cart allows flexible positioning without interference of other instruments. The intuitive user interface is controlled by a large image viewing touch screen monitor. 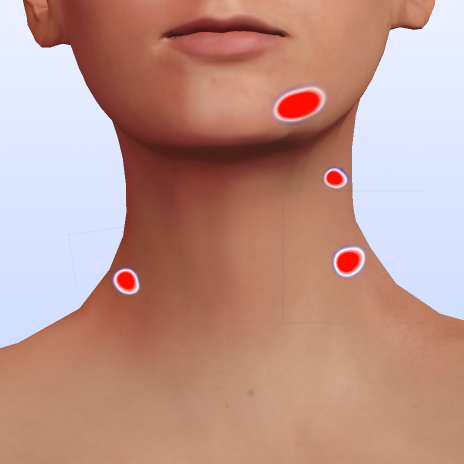 It enables direct mapping, easy access and resection control during SLNB in breast, melanoma and head & neck as well as in the ROLL and RSL technique with a seamless integration in the clinical workflow. The 3D declipseSPECT presents a potential tool in refining the excision margins of tumor in the ROLL technique. The possibility to observe the harvested tissue and the tracer activity within it offers a realistic view of the surgical procedure suited for the operating room. The declipse®SPECT technology and its intraoperative use for navigated sentinel lymph node dissection enables safer surgeries, and less invasive procedures. This can ensure a high quality outcome for every individual patient. The innovative 3D declipseSPECT technology may make the sentinel node biopsy easier and more reliable. New technologies like 3D declipseSPECT will also open up lymphatic mapping to additional cancer types in locations with a more intricate anatomy and cancer types with more complex lymph drainage. declipse®SPECT enables for the first time worldwide intra-operative 3-D reconstruction of radioactivity distribution based on handheld gamma probe detectors. This solution extends the services of nuclear medicine from pure diagnosis towards localization and guidance during interventions, providing an innovative and powerful tool for quality assurance in radio guided surgery. declipse®SPECT enables minimally invasive resection procedures thanks to its 3-D imaging properties and ensures high quality standards during procedure in three dimensions. declipse®SPECT is a SPECT imaging device based on a handheld gamma probe reported as freehandSPECT imaging in the literature [Wendler2010]. In contrast to traditional SPECT imaging solutions, declipse®SPECT does not rely on a gantry mounted gamma camera rotating around the patient, but a handheld gamma probe extended by a 3-D tracking system. A scan of 1-2min around the patient from anterior-posterior and lateral directions enables a 3-D reconstruction of the radioactive distribution in the target region with a spare set of projection data. declipse®SPECT currently supports all low energy radionuclides. Tc99m, which is currently the most commonly used radionuclide for SLN imaging, is generating full 3-D images with a resolution of 5mm in all three dimensions as deep as 7cm from the surface. An optical infra-red camera ensures sub millimeter precise localization of patient and gamma probe in space. Synchronized readings of gamma detector and navigation system enable a reconstruction in the same coordinate system as well as registration-free navigation, i.e. showing correlation of the imaging data with respect to any surgical instrument, the basis for image guidance. An integrated video camera provides a direct correlation of the 3-D images projected onto the image plane. This provides gamma camera images from different viewpoints with direct anatomical correlation through overlay onto the optical image. 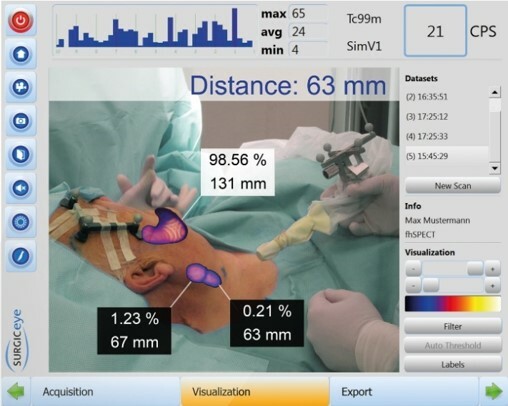 This innovative technology of augmented reality enables direct referencing and visualization of the activity onto the real-time video of the patient. The advantage over standard monitor based image viewing is the direct overlay and anatomical correlation for intuitive orientation, localization and resection of radioactively marked structures. Thus any standard surgical instrument is guided to the region of interest without any modification. Bluemel et al. 2016. “3D Scintigraphic Imaging and Navigation in Radioguided Surgery: Freehand SPECT Technology and Its Clinical Applications.” Expert Review of Medical Devices, February. doi:10.1586/17434440.2016.1154456. Schilling et al. 2015. ”Role of intraoperative sentinel node imaging in head and neck cancer.” Clinical and Translational Imaging, April. doi:10.1007/s40336-015-0121-3. Sulzbacher et al. 2015. “Clinical Usefulness of a Novel Freehand 3-D Imaging Device for Radio-Guided Intraoperative Sentinel Lymph Node Detection in Malignant Melanoma.” Clinical Nuclear Medicine, July. doi:10.1097/RLU.0000000000000882. C. Bluemel et al., “iROLL: does 3-D radioguided occult lesion localization improve surgical management in early-stage breast cancer?,” Eur. J. Nucl. Med. Mol. Imaging, Jul. 2015.